I’m the guy at the hockey game who likes to yell “Drop the puck” at the officials when I think he’s keeping the guys with the sticks waiting in the faceoff circles too long. Last week I learned a new meaning of one of my favorite phrases between periods of the Syracuse Crunch contest. 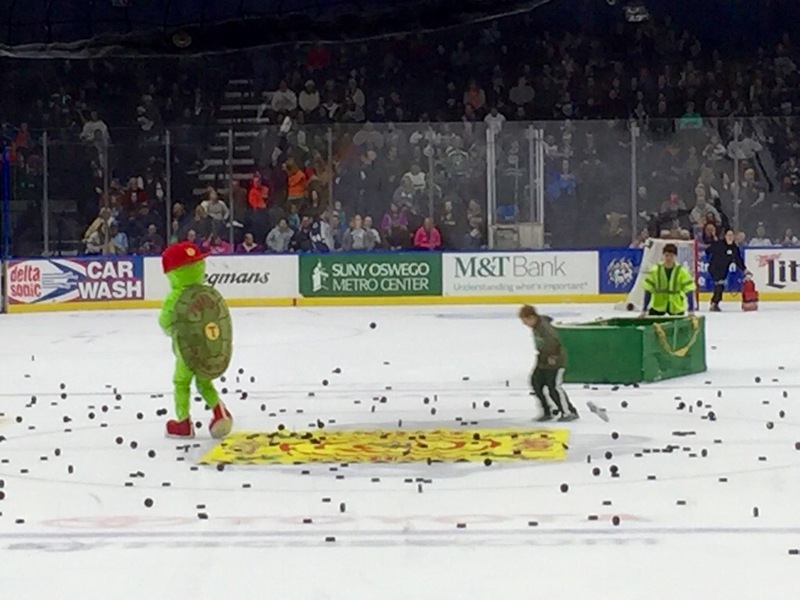 They told some kids around the concourse of the Onondaga County War Memorial to let loose with pucks at a big target they’d placed at center ice. Hundreds of the black rubber discs bounced about and settled, some quite close to the red line, some not so. 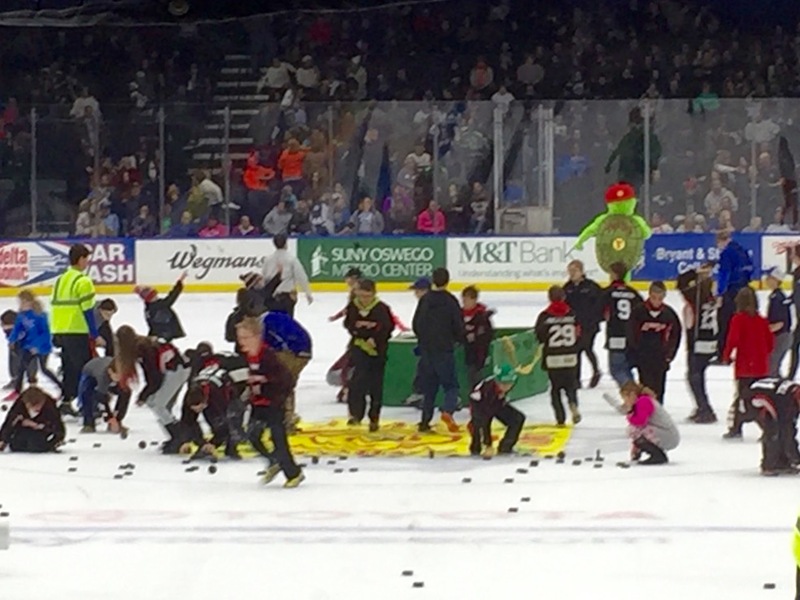 And then it got even crazier, as another bunch of kids scurried around the ice picking up the pucks, appearing to grab as many as they could, while a squad skated around with big brooms sweeping up others. Gather up the pucks, please. If anybody knows what this is all about, please feel free to explain what might be one with an accurate toss from afar. Have you ever won something with a feat of skill, and if so, please explain. What do you think the puck toss might entail? How many pucks do you think you could gather up running around against all those kids? our hockey player is eight, been playing since he was three, his Dad is one of the coaches…this is a Cleveland team…….maybe we will meet someday on the ice Mark. Well, not really ON the ice, as I never could stand up on ice skates. I am not a skater, either, Gradmama. I played broomball in a city league here, where the players wore special shoes made for the ice rink with little rubber suction cups on them. This was 30 years ago for me, though! 🙂 Have fun watching your 8-year-old grand. What I leaned from this post, Mark, is that I should yell more at officials. WTP?! Yup. You can if you want, Ann! Great idea, and the Crunch is full of them, Ben. Thanks for the skinny. I love it. Running around on the ice? Oh, I don’t know, Mark. I think I’ll just sit this one out and happily watch. My nephew is a big hockey player now. He absolutely loves it! I’ve taken fall before, Mark. Not fun! I still haven’t seen him play yet. Hopefully, soon. I just know he’s really into it!